Camping in Brittany is a sure to be a rich experience due to its fantastic coastline, traditional towns, villages and cities, and of course it’s incredible food. With its proximity to the channel ports and regional airports it’s also one of the easiest regions to reach – perfect for a short break, a family holiday or a quick getaway for just the two of you. Brittany’s rugged northern coastline is home to picture postcard seaside resorts and excellent visitor attractions. The south of Brittany is a land of charming towns, sophisticated resorts, and delicious seafood and cider. Holidays in Brittany offer a huge choice of things to do, and whether you choose the north or the south, or a multi-centre holiday to experience both, there are an abundance of places to visits, experiences to be had and stunning coastline to explore. 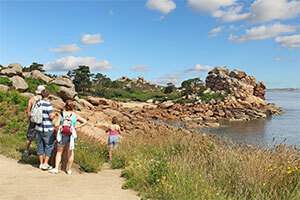 Take a look at the campsites Canvas Holidays has dotted along the Breton coastline. Rennes The capital of Brittany, Rennes is graced by lovely old buildings, cobbled streets and quaint timbered houses. The eco-museum just outside the town tells the story of a Breton farm over five centuries, and there are plenty of animals to see. Océanopolis Situated in Brest, Océanopolis is a huge aquarium and research centre with pavilions dedicated to three ecosystems: polar, tropical and temperate. Watch the penguins and seals being fed, and take the elevator to the depths of the shark tank. Vannes Vannes is great for families, with some lovely shops and cafés, a busy food market and lots to interest children, including an aquarium, a butterfly garden, and a museum of mechnical toys. Visit the archaeology museum in a 15th-century mansion house and La Cohue, the medieval covered market that now houses the museum of fine arts. Pointe du Raz Pointe du Raz is the ‘lands end’ of France, a rocky headland offering coastal walks and dramatic views over the Atlantic Ocean as the waves crash below. Visit nearby Audierne for L’Aquashow aquarium and bird experience. Standing Stones, Carnac Carnac is famous for its megalithic sites, with literally thousands of standing stones, many of them aligned in converging rows. There are also dozens of dolmens, piles of massive stones that were built as tombs. Saint Brieuc At St Brieuc, the stoutly fortified cathedral is surrounded by a medieval old quarter of timbered houses. Housed in the historic brickworks, La Briqueterie is an eco-museum that explores life in the area in the 19th century, with exhibits, events and workshops. Saint-Brieuc Bay is Brittany’s largest natural reserve. To find your perfect campsite in Brittany please use our interactive site finder, call our knowledgeable customer advice team on 01 242 1901, or go straight to the individual campsite pages.